The people of Ladakh, by and large, exhibit a natural joie-de-vivre, which is given free rein by the region’s ancient traditions. Socio-religious festivals, including the annual festivals held in the monasteries, provide the excuse for convivial gatherings. Archery is a pastime for all in summer. Among the Buddhists this sport often takes the form of open-air parties accompanied by dance and song. The game of polo is yet another proud element of the popular culture. Archery is an ancestral sport of Ladakh, which is part of the culture. In Leh and its surrounding villages, archery festivals are held during the summer months, with a lot of fun and fanfare. They are competitive events, to which all the surrounding villages send their teams. The sport itself is conducted with strict etiquette, to the accompaniment of the music of surna and daman (oboe and drum). As important as the sport itself are the interludes of dancing and other entertainment. Chang, the local barley beer, flows freely, but there is rarely any rowdiness. The crowds attend in their Sunday best, the men invariably in traditional dress and the women wearing their brightest brocade mantles and their heaviest jewellery. Archery may be the pretext for the gathering, but partying is the thing. In Kargil area, on the other hand, the archery competitions are more serious and bereft of the dancing and music, and these are held in early spring, at the time of the thawing of the winter snow and frost. 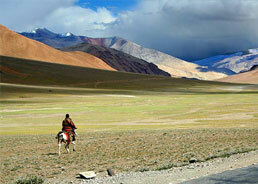 Polo, the other traditional sport of Ladakh is indigenous to the western Himalayas, especially to Baltistan and Gilgit. It was probably introduced into Ladakh in the mid-17th century by King Singge Namgyal, whose mother was a Balti princess. The game played here differs in many respects from the international game, which is adapted from what British travellers saw in the western Himalayas and Manipur in the 19th century. Each team consists of six players, and the game lasts for an hour with a ten-minute break. Altitude notwithstanding, the hardy local ponies - the best of which come from Zanskar – scarcely seem to suffer, though play can be fast and furious. Each goal is greeted by a burst of music from surna and daman, and the players often show extraordinary skill. Unlike the international game, polo in Ladakh is not exclusively for the rich. The people of Ladakh, particularly the Buddhists, believe implicitly in the influence of gods and spirits on the material world, and undertake no major activity without taking this influence into consideration. The lamas are the vital intermediaries between the human and the spirit worlds. Not only do they perform the rites necessary to propitiate the gods, but they also take on the role of astrologers and oracles who can predict auspicious time for starting any work, whether ploughing the fields, or taking in the harvest, arranging a marriage or going on a journey. The most famous monk-oracles are those of Matho Gompa. Chosen every three years by a traditional procedure, two monks spend several months in a rigorous regimen of prayer and fasting to prepare and purify themselves for their difficult role. When the time comes they are possessed by the deity known as Rong-tsan, whose spirit enables them to perform feats that would be impossible to anyone in a normal state such as cutting themselves with knives, or sprinting along the Gompa's topmost parapet. In this condition, they will answer questions concerning individual problems and public welfare. However, the spirit is said to be able to detect questions asked by skeptical observers for testing him, to which they react with frenzied anger.